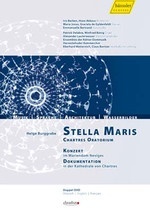 "Stella Maris" is an Oratorio that transports the viewer to a singular world, consisting of light and water projections, language and music in the two most famous sacred buildings Europe. When someone is telling an old story or legend, how much more effective it is when they are able to create an exciting atmosphere, filled with images and sounds to captivate the imagination of the listeners. Helge Burggrabe is such storyteller with a gift for bringing his narrations to life! Neviges is one of the most famous sacred buildings in the modern style and stands in both in the long tradition and in strong contrast to the venerable Chatres cathedral. Helge Burggrabe tells the story of the Life of the Virgin Mary. Playing the role of Mary for the concert in Neviges is the well-known actress Iris Berben and for the documentary at Chartres, Hiam Abbass. Light and sound, multi-media projections and language are united in a singular total concept. This unique project is available on 2-DVDs. An incomparable bridging of tradition and modernity.